When the Allies secured New Guinea’s Goodenough Island in October 1942, they left a small Australian occupation force to hold this important position against the Imperial Japanese. 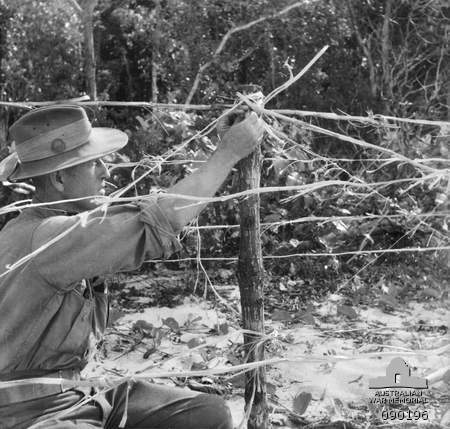 They succeeded through deception: The Australians built dummy structures (including a hospital), pointed logs at the sky to suggest anti-aircraft guns, wove jungle vines into barbed wire, lighted numerous “cooking fires” at night, and sent messages in easily broken code that suggested that a full brigade occupied the island. It worked. The small force held the island until December 28, and a new garrison arrived the following year. In 1799 two Royal Navy ships met on the Caribbean Sea, and their captains discovered they were parties to a mind-boggling coincidence that would expose a crime and make headlines around the world. In this week’s episode of the Futility Closet podcast we’ll tell the story of the shark papers, one of the strangest coincidences in maritime history. We’ll also meet some Victorian kangaroos and puzzle over an expedient fire. 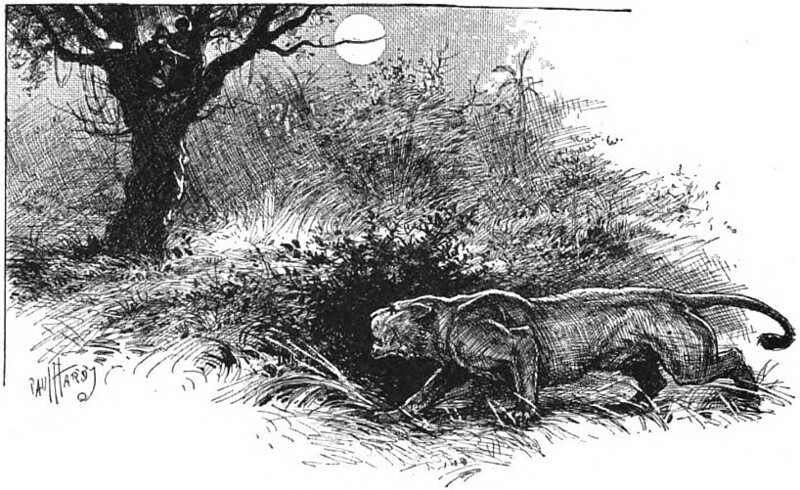 In 1898, two lions descended on a company of railway workers in British East Africa. For nine months they terrorized the camp, carrying off a new victim every few days, as engineer John Patterson struggled to stop them. In this week’s episode of the Futility Closet podcast we’ll track the “man-eaters of Tsavo” and learn what modern science has discovered about their motivations. We’ll also consider more uses for two cars and puzzle over some prolific penguins. Under enemy fire on March 25, 1945, radio operator Temple Leslie Bourland bailed out of a C-47 over the Rhine. He injured his hip but avoided capture, hiding in a foxhole for two days while using his parachute as a blanket. When Allied troops discovered him he returned to his unit. That summer he met San Antonio secretary Rosalie Hierholzer, and during their brief courtship he showed her the bullet-riddled parachute, which he kept in his trunk. Rosalie’s aunt Lora offered to make it into a bridal gown, and Rosalie wore it at their wedding. The train still retained some of the military seams. 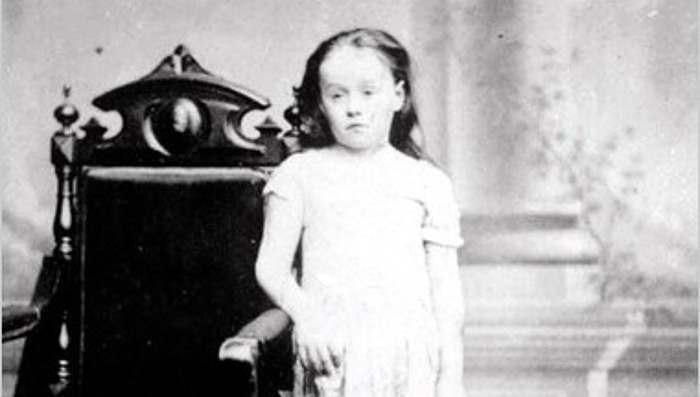 In 1873 a Methodist missionary in New York City heard rumors of a little girl who was kept locked in a tenement and regularly whipped. She uncovered a shocking case of neglect and abuse that made headlines around the world. In this week’s episode of the Futility Closet podcast we’ll tell how one girl’s ordeal led to a new era in child welfare. We’ll also outsource Harry Potter and puzzle over Wayne Gretzky’s accomplishments. 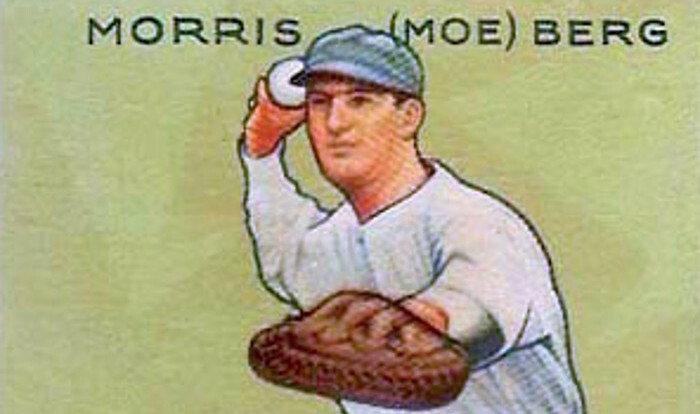 Moe Berg earned his reputation as the brainiest man in baseball — he had two Ivy League degrees and studied at the Sorbonne. But when World War II broke out he found an unlikely second career, as a spy trying to prevent the Nazis from getting an atomic bomb. In this week’s episode of the Futility Closet podcast we’ll follow Berg’s enigmatic life and its strange conclusion. We’ll also consider the value of stripes and puzzle over a fateful accident. In 18th-century New Mexico unbaptized Indians were often sold as domestic slaves. This was illegal, but the authorities accepted it on the theory that it “civilized” the slaves. In 1751, the wife of Alejandro Mora lodged a complaint in Bernalillo that her husband was treating their slave Juana inhumanely. The constable who investigated found Juana covered with bruises. Mora had broken her knees to keep her from running away and reopened the wounds periodically with a flintstone, so they were covered with festering ulcers. Her neck and body had been burned with live coals, and manacles had scabbed her ankles. Mora protested that he had only been looking out for Juana’s welfare. He had raped her only to test her claim of virginity, and he had hung her from a roof beam and beaten her only because she resisted him. The authorities removed her from Mora’s household, but he received not even a reprimand. 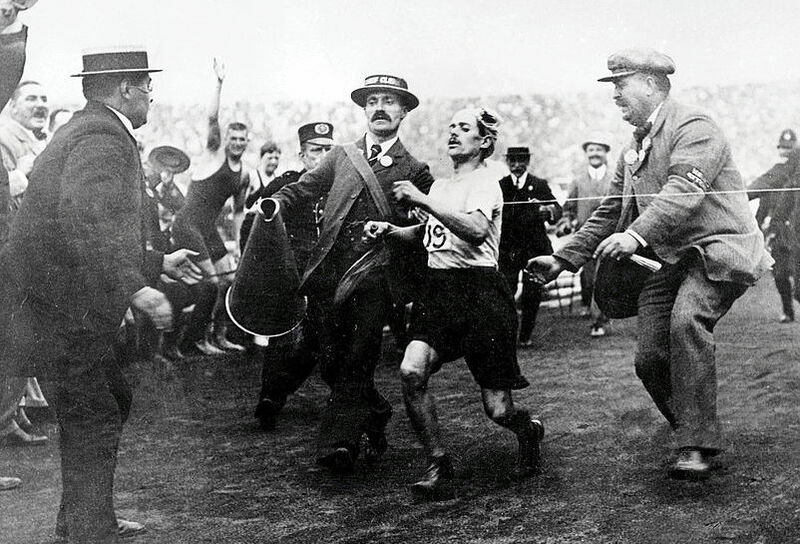 In 1908 a 22-year-old Italian baker’s assistant arrived in London to take part in the Olympic marathon. He had no coach, he spoke no English, and he was not expected to challenge the elite runners at the top of the field. In this week’s episode of the Futility Closet podcast we’ll follow Dorando Pietri on the most celebrated race in Olympic history. We’ll also ponder the Great Mull Air Mystery and puzzle over a welcome murder. When violinist Hugh Gordon Langton was killed in World War I, the Commonwealth War Graves Commission inscribed a phrase of music (below, click to enlarge) on his headstone in Belgium’s Poelcapelle British Cemetery. 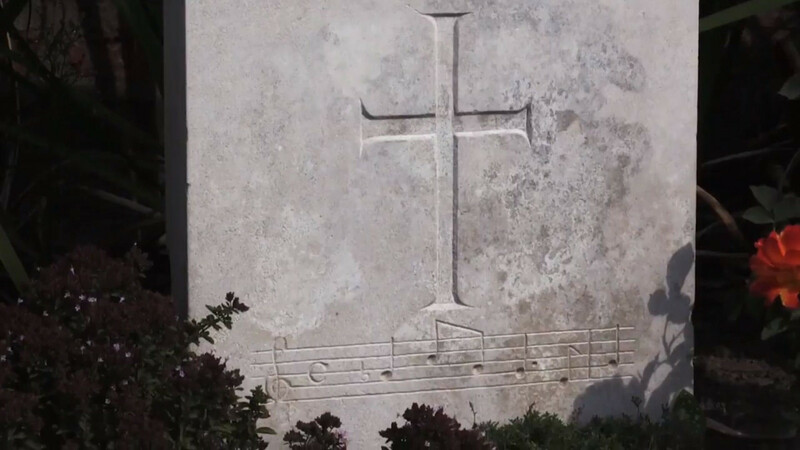 Langton is the only casualty who was commemorated with a piece of music — the CWGC maintains more than a million graves and memorials worldwide, and only this one bears musical notes as an epitaph. If you can identify the tune, please contact the Commission. 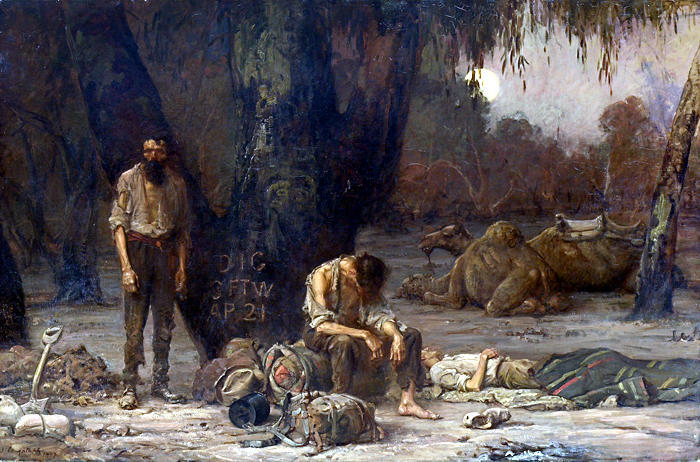 In 1860 a party of explorers set out to traverse the Australian continent, but bad management and a series of misfortunes sent it spiraling toward tragedy. 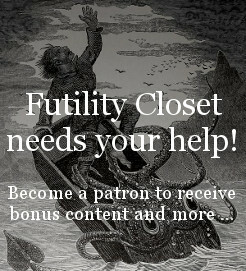 In this week’s episode of the Futility Closet podcast we’ll tell the story of the Victorian Exploring Expedition and its dramatic climax at Cooper’s Creek. We’ll also try to validate Archimedes and puzzle over an unlucky thief.